GoldMine CRM - The Trainer's Advisory Network Ltd.
GoldMine Premium, an award winning CRM solution. Proven and easy to use, GoldMine allows you to focus on building long-lasting customer relationships. 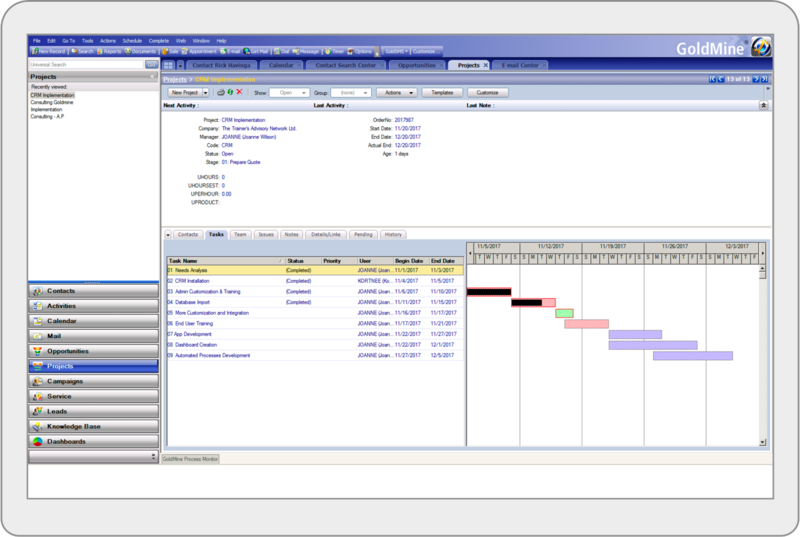 Goldmine Premium Edition offers contact management software that is used by organizations of all sizes to manage the sales pipeline, marketing programs and deliver customer support. GoldMine is a leading provider of mobile relationship management solutions for small businesses worldwide. Over 1 million users have selected GoldMine to help them manage over 1 billion relationships. GoldMine has been selected by businesses in more than 80 verticals and 45 countries to grow their businesses and build enduring relationships. GoldMine lets you select the CRM software option that’s right for you. Enjoy both Cloud CRM and On-Premise solutions, and have the freedom to utilize each solution as your business requirements or preferences change. Add GoldMine to one of your servers for the best value over time. When you own your GoldMine CRM software, costs drop over 70% in year 2 and beyond since you do not pay a monthly subscription fee. Flexible desktop-as-a-service! If you don’t have a server or don't want to maintain a server any longer, then GoldMine Cloud is a great choice. Run multiple applications with one subscription. Add applications such as Office 365, QuickBooks and your other business applications. Mobile access from anywhere on smartphones, tablets, PCs and Apple computers. Sales people on the road? Update work orders, access your customer info, manage leads and provide status updates remotely! Established over 25 years ago, GoldMine was instrumental in leading the CRM software market. Easily manage contacts and engage with your customers efficiently through marketing automation, sales forecasting and opportunity management to build relationships for long-term business growth. From sales and customer service to marketing automation, marketing management and mobile, GoldMine delivers a complete solution with unparalleled power and functionality. 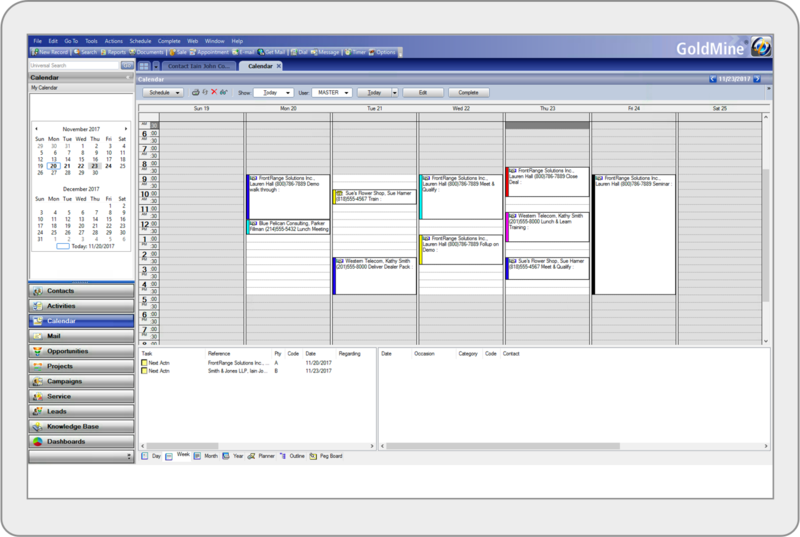 Our interface is intuitive and adapts to you with incredible flexibility. When you're stuck we are here to help you. It is important to follow through with CRM user training. CRM training classes increase users’ awareness of features, functions and usability in order to increase their confidence in working with the system and provide greater efficiencies. 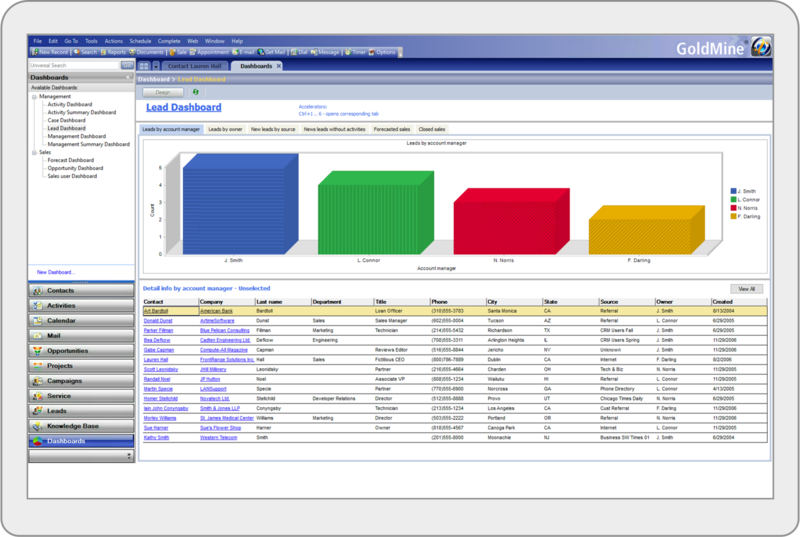 A CRM training class aids in user adoption, which improves usability and acceptance. A new browser-based app that’s included with GoldMine Premium Edition and installed as part of the GoldMine Connect package. 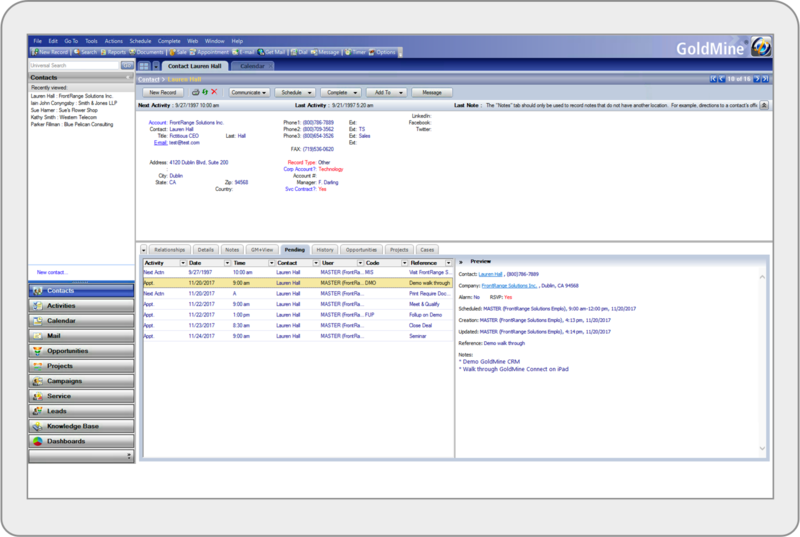 GoldMine Web provides the look and feel of a web client and doesn’t require installation for the end user. Contact information and activities are accessible anywhere with an internet connection. Whether you are on your desktop, laptop, tablet or phone, GoldMine is fully responsive to any device you are using. Sales people on the road? 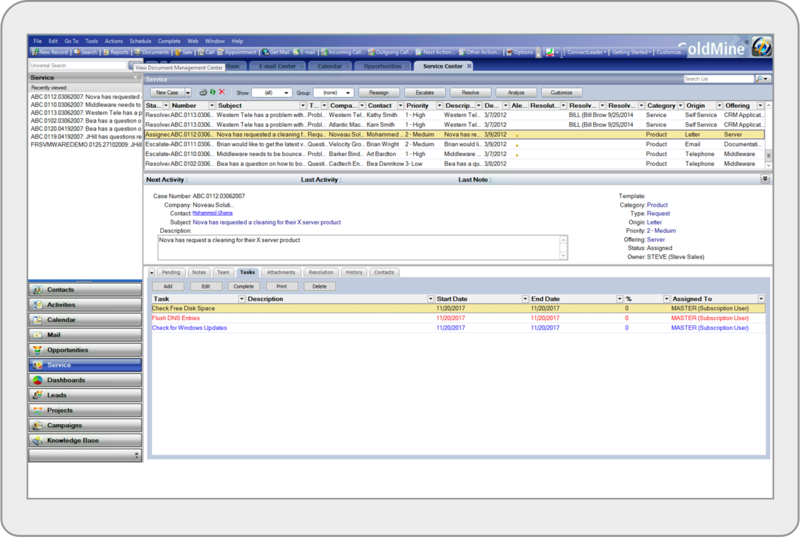 Access your customer info, manage leads, update work orders and provide status updates remotely. Choose to access GoldMine CRM in Our Cloud and say hello to pre-eminent security, maintenance and updates, with 24/7 access via any web-enabled device. Installed and configured on your server and your workstations. Enjoy the flexibility of complete ownership and control. Utilize GoldMine Connect directly from your in-house server on your devices. Established over 25 years ago, GoldMine was instrumental in leading the CRM software market. 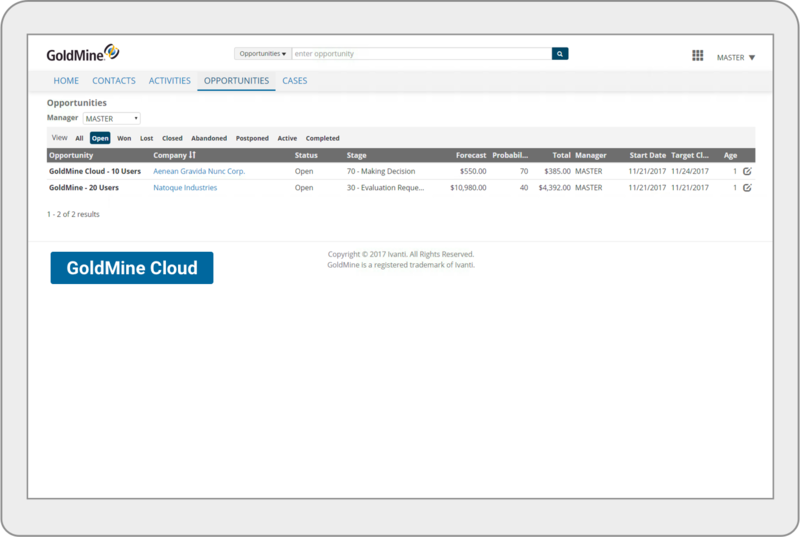 GoldMine CRM helps businesses grow customer relationships by managing their contacts, engaging with customers through marketing automation, sales forecasting and opportunity management. GoldMine helps build relationships for long-term business growth and stability with its proven CRM capabilities. We develop a project plan with distinct stages after we have done a needs analysis meeting to see exactly what you want to accomplish with your new CRM software.